I have had this project on the bench for quite a while. Finally did it during a snow storn this winter. Or 2 or 3. Took quite a while to do but I am pleased with the results. 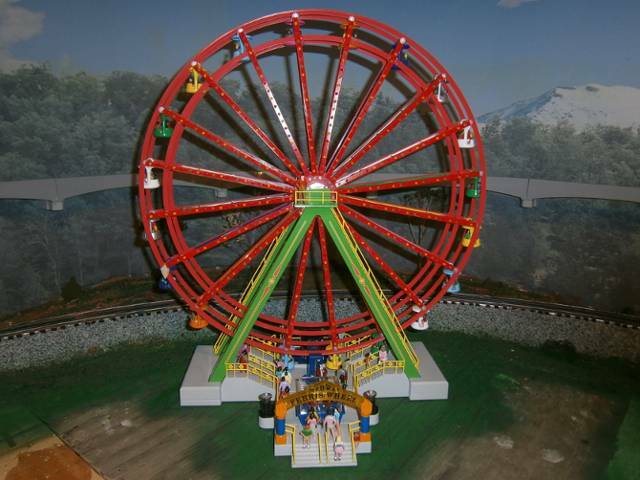 The original Ferris Wheel just did not cut it. I was torn between all white lights or colors and decided to go with the colors. 380 LED's - thats a lot of holes drilled, mounting , soldering etc. Added about 45 kids to the actual cars and using kids I still had to cut their legs off to make them fit. Placed about 40 adults and children in line and or exiting. If there is any interest, I do have pictures of the build I can post. Thanks, here is the build. 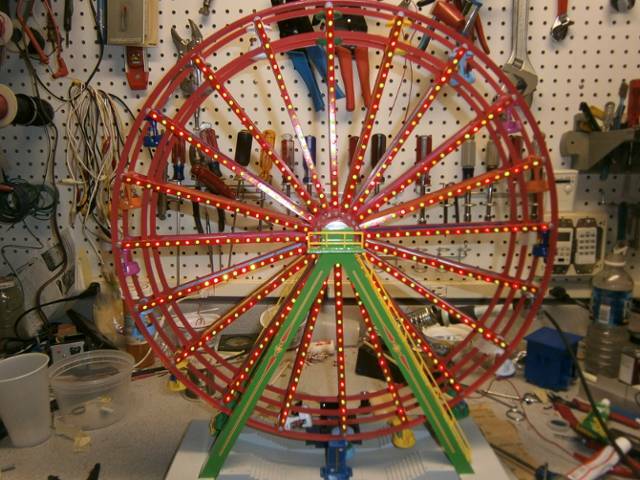 First off, I used styrene U channel strips the same width as the spokes on the Ferris Wheel. I marked off the spacing and drilled holes. I am using a 24 volt supply so I planned on 3 sets of 7 LED's per spoke. 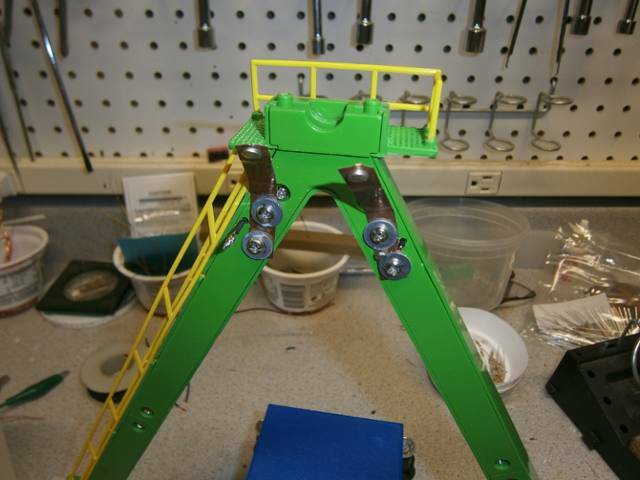 Each set would have its own series resistor. I used low light 3mm LED's as you will be looking right at them and don't want to be blinded. I also grinded off the "fake" yellow lights that were on each spoke. 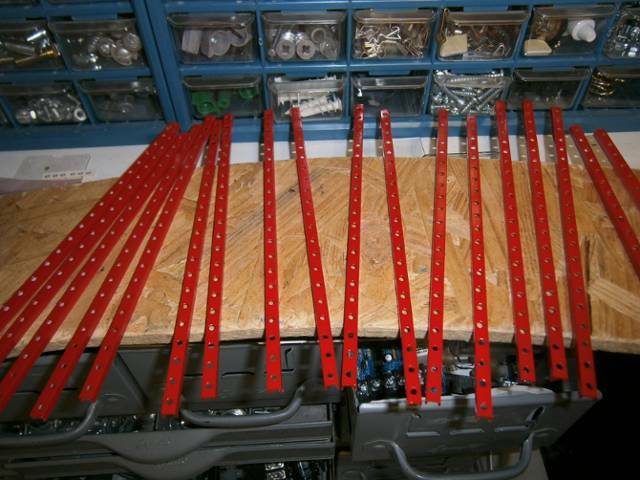 Next was to paint the strips the same color red as the Ferris Wheel or close enough. Next up was to stuff the spokes. 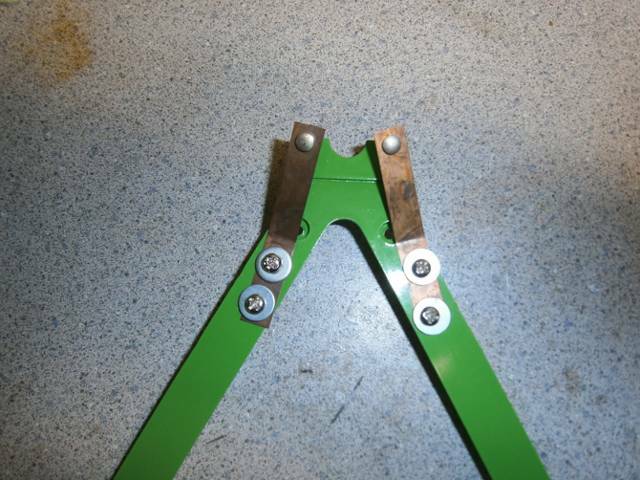 I then cut down the leads and soldered them together with their series resistor. I ran two wires out of each spoke, 1 neg and 1 positive with a 4 or 5 inch pigtail. The next few pics show how I made the connection to the rotating wheel. I mounted two leaf contacts I had laying around on each side of the wheel. 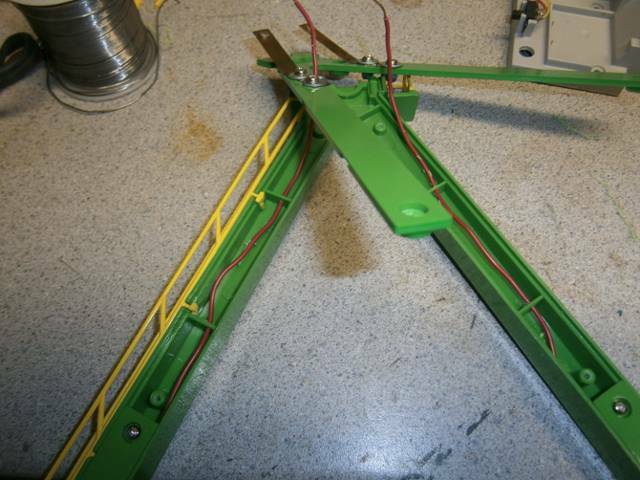 I used two on each side to have a better chance of always having a complete circuit. The wires ran down the support column to underneath the Ferris Wheel. Next I mounted my LED strips to the front of each spoke, drilled a hole through to the back and passed the wires to the rear of the Wheel. 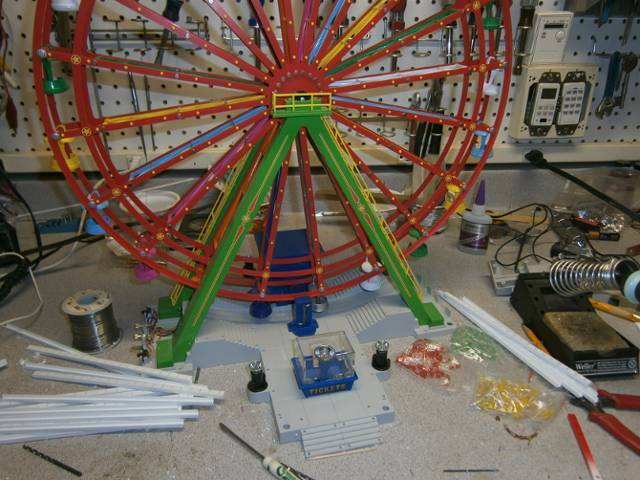 In the next pic you will see a fender washer mounted to the hub in the center of the Ferris Wheel. Another is on the back. A wire is soldered to the washer and brought to the back where both the positive and negative connections were made. All negative to one washer and all positive to the other. I had to adjust the contact pressure to get it just right but the wheel now turns and I get no flicker of the lights at all. 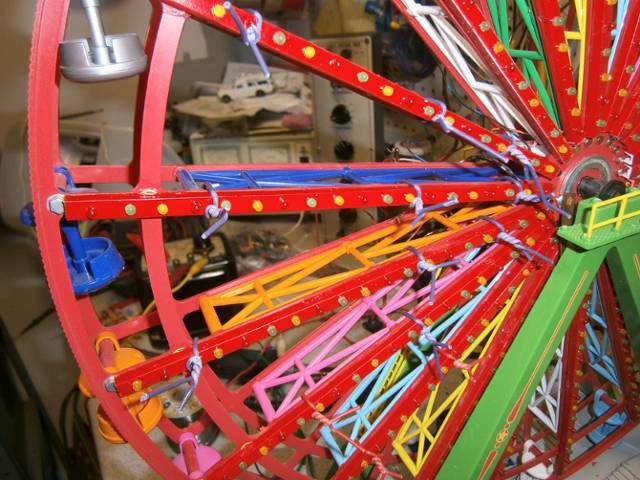 The last pic just shows the Wheel reassembled with railing and the people added. I also removed the spot light in the ticket booth and replaced it with two park employees that will gladly take your money. 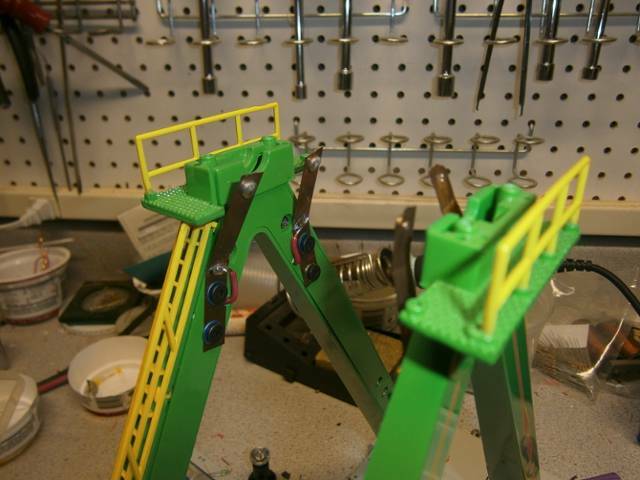 Great project, nice job Bill. Can we send our Ferris Wheels to you now ? 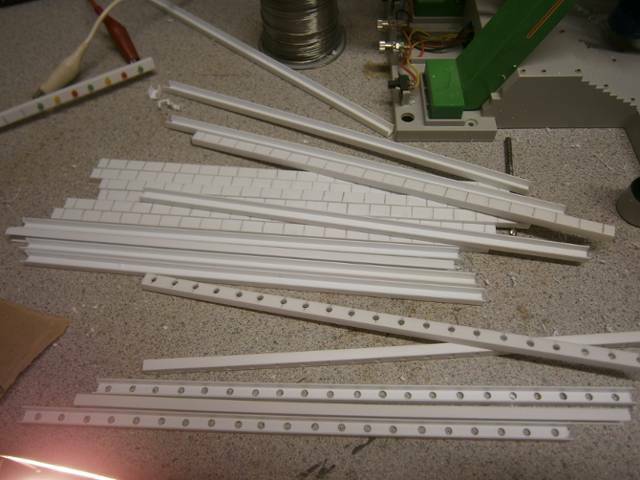 What was your source for the styrene U chanel and LED's ? How did you fasten the U chanel to the spokes ? Thanks for the kind words Doug. I believe this is one of those projects you just do one time !!! Would be more than happy to verbally help in any way I can -LOL. The U channel is from Plastruct - I believe I used part no 90584. 3/16 deep channel styrene. The LED's I purchased from Circuit Specialists on a closeout sale. I just checked and I purchased 1000 of each color which means I still have 800 plus left of each color. Because they are low intensity, they are dirt cheap. If you decide to attempt this project, we can work something out if you want. Fastening - look close 2 pics back and tou will see where I twisted a couple of wires in a few places to hold the U channel in place. 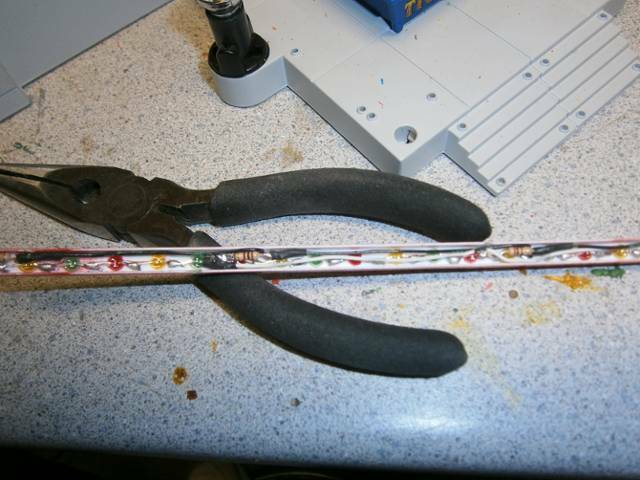 I then applied CA glue to several spots along the channel and when dry, removed the wire ties. Very clever, and very nice. 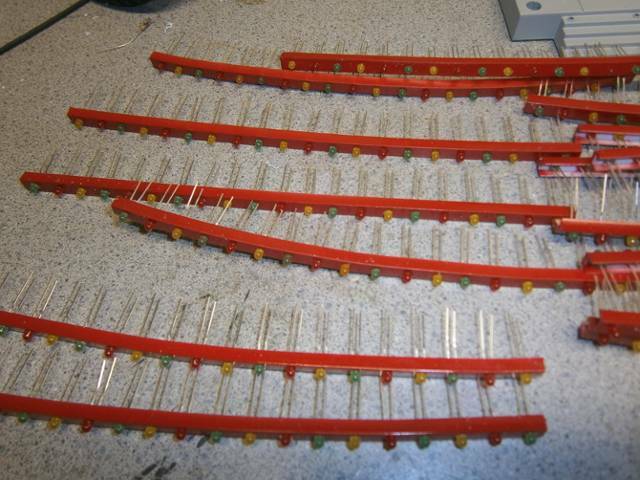 I agree on the use of low-intensity LEDs, they are probably the best kind to use for many of the kinds of marker lights we deploy in model RR'ing. Oh also - I imagine the low-intensity LEDs draw less power, do you know if that's right? Do you know the specs on those? I imagine they run on the same voltage, but draw less amps? Yes, you are correct. I believe the forward voltage on these low intensity LEDs is around 2.0 volts which makes the operating current around 20 mills. The bright ones we seek out to light up our projects typically have a forward voltage of 3.0 + and draw around 30 mills but can go much higher. I don't have the exact specs on the LEDs that I used. For all of my LED projects I typically build the circuit using aligator clip leads, a variable DC power supply thats on my bench, a resistor substitution box and a meter in series in the circuit to give me current. I aim to get the most LEDs in the circuit which is pretty much fixed by the forward voltage of the LEDs and the supply that I am going to use in the end. Then it is just dialing up the resistor sub box till I get the correct current flow and then you adjust for what resistors you have to use. Nice approach, keeps it simple. 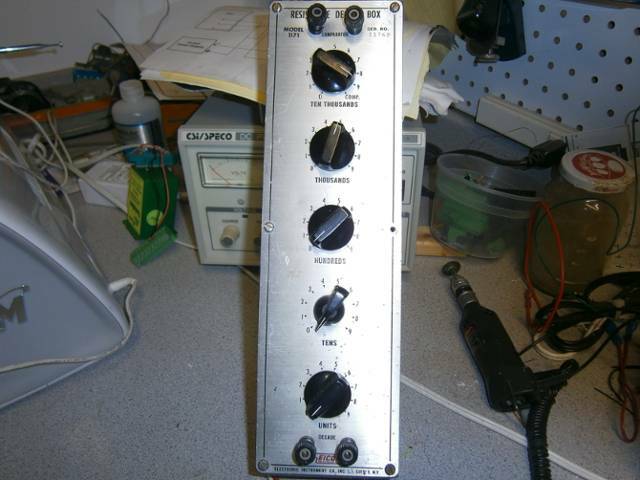 What is a resistor substitution box? Oh John , you need one of these as I know you play around with circuits. This is an old one I got off of Ebay many years ago for $10.00. I see they now have a little more modern ones. http://www.ebay.com/itm/ELENCO-RS-500-1-1-Watt-Resistor-Substitution-Box-NEW-/330969160155?pt=LH_DefaultDomain_0&hash=item4d0f4c99db#ht_301wt_1296 You just have to stay within the power limits of the box or you will fry the resistor. My box and the one above are 1 watt models. Bill, I might be interested in some of the lights, how many different colors ? Lets talk about 100 of each color. Bill that's brilliant, I love it! Had know idea such a creature existed. Boy could that save time when playing around on breadboards. Thanks!